Recently, I wrote a post about Red Riding Hood—two versions of the story, and how the story gets used in popular culture. If you like folktale novelizations, Sarah Blakley Cartwright has a novel about Red Riding Hood. But Little Red isn’t the only one who gets—or deserves—attention. Two Canadian authors—Robert Paul Weston and Thomas Wharton—have worked to re-invent the character of the big bad wolf. The wolf, of course, is the predatory villain of the folktale, and as far as I can tell, Charles Perrault’s story is the only one in which the wolf isn’t out-smarted or killed. Weston’s Dust cityand Wharton’s The Shadow of Malabronintroduce the character of the wolf in interesting ways. 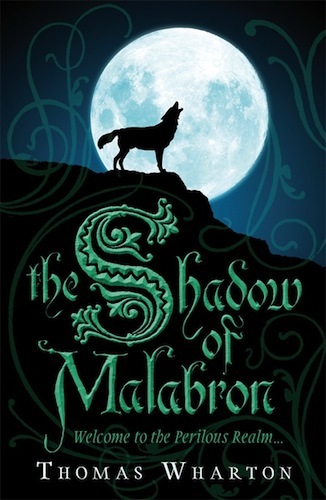 In each of these books, the wolf is a sympathetic character—Henry Whelp from Dust city is a troubled teen, serving time in a juvenile delinquent centre, and trying to come to terms with his father, who sits in prison for murdering an old woman and her granddaughter; whereas Shade from The Shadow of Malabronis an otherworldly wolf that Will, the book’s main character, meets in a library, and who agrees to accompany Will on his quest. Both henry and Shade offer ways of rereading the big bad wolf, not just as sympathetic characters, but as heroic ones. Henry is determined to follow his father’s hunches about the nature of fairydust, a narcotic available to the hominids and Animalia of the city. Dust City is an urban fantasy, full of recognizable folktale characters reinvented for Weston’s gritty city scape—Detective White, the tough, independently minded cop whose interest is justice, and Skinner, the evil crime boss, who literally has the golden touch. “I land on something soft. A great heap of blue fairydustmined, refined, and on its way to pharmacies all across the city. Only now it’s got an added ingredient: a big bad wolf. … I climb up on the sheet of metal and peek out through the ragged me-shaped hole. The Shadow of Malabronis the first in the Perilous Realmseries, and it’s fantasy in the Tolkienian style. Shade becomes Will’s friend and companion, and they set out with a company from the city of Fable to seek Will’s story and help him return home—if they can avoid Lotan, the servant of the Night King, who is determined to consume all stories in the Perilous Realm. “I followed the tracks they left, to their camp,” he said at last. “I tore and killed many, and those that were left ran off, but they had pierced me with their iron in many places. I wandered, a fever burning in me. I could not hunt, could not eat. I came at last to a forest where I smelled a new scent, one that was unknown to me. The scent of folk like you. I did not know if it meant danger or not. I crept up to their dwellings, in a clearing in the woods, to see if this unknown scent meant danger. There were people there, working, talking, laughing together. I had never heard laughter. It sounded strange to me, and I think I would have liked it, but all I could feel was pain, and hate. And then I saw a child. A girl in a red cloak with a hood, going off into the forest by herself. She was carrying a basket covered in a cloth. I followed her. I was hungry, and I wanted to kill. The girl walked quickly, but I ran ahead of her and stood in her path. She was frightened, but she was brave, too. And she did not hate. I could see that in her eyes. She was not like the ghool. There you have it. Two big bad wolves who aren’t so bad anymore. I highly recommend both these books, as much for how they represent folktales and folktale characters, as they offer two strikingly different versions of the wolf from the folktale. Resurrecting such villains into heroes says something about the nature of story, but more about the persistent power of folktales to continually shape our imaginations. Happy spring. This year apparently marks the earliest spring in over a century. The vernal equinox happened on March 19 or twentieth, depending where you live in the northern hemisphere. Spring is about many things to many people. For me, it’s about yard clean-up, restarting the composter, the Easter weekend, the end of the academic year, and most of all being outside, walking, and reading. Alberta has seen a mild winter, so I haven’t felt as caged as I normally do by this time of year. Nonetheless, the sense of freedom that comes with walking, especially in the evening, is one that always takes me a little by surprise. And, of course, I’m not the only one out there. People are out walking, biking, and running—all exhibiting the intoxicating possession that overcomes those who look eagerly for signs of spring. Reading and walking is something I do all year, but going for a walk in a spring evening is a far cry from navigating ice and snow on my way to catch the train. And when I say walking and reading, I mean playing audio books on my MP3 player as I tramp around the neighbourhood. I know of people who walk while reading a physical book, but this strikes me as a more dangerous form of distracted walking. I listen to my books, which I recommend to anyone who wants to be outside and reading. I always try to keep a new book on the go, but I also tend to reread more than most people I know. A good way for me to both reread and read something new is to read everything by a single author. A few years ago, I decided to read all of the dune books, which meant everything by Frank Herbert, but also everything by Brian Herbert and Kevin J. Anderson. Brian Herbert and Kevin Anderson took it upon themselves to write prequels for the Dune books, as well as a conclusion to the series. It kept me going for most of a summer. This spring and early summer, I’m thinking either DouglasAdams, Terry Pratchett, or Patricia McKillip. Pratchett might be the most challenging of these three because of the sheer number of Disc World books. But whatever I go with, I’ll be happy to be walking and reading as the spring unfolds. Get out and enjoy the lengthening days.